I recently went back to New York after not visiting for 7 years! It was even more beautiful than I had remembered. I used to live there when I was first starting out as a model and I honestly cannot believe that my mom and dad let me go there by myself for so long! While I was in town I also finally got my hair cut after 4 months of not touching the roots! Zoe Rose at Arrojo Salon in SOHO, brought me back to a true brunette. The blonde was so damaged and split! I miss it though. On my birthday I had a chef tasting with celebrity chef Brian Tsao at Mira Sushi after a long day of meetings, then stopped by The Spot Dessert Bar for one last indulgence. I found THE perfect vintage Calvin Klein jeans. Here's how I styled them. February 24- Got my roots done. I went to Phuket, Thailand for a week in March and experienced one of the most beautiful destinations and cultures around the world. I went with Vampped and stayed with Villa Getaways at the Andara Resort Villas in Kamala Beach. We had a mansion-size villa including the most beautiful view of the ocean, islands and shoreline. I was treated to a Thai massage, walked the beach with the locals, did yoga next to the infinity pool and ate the most delicious traditional home-cooked Thai food from our in-house villa cook. All I drank for a week was coconut water, coffee and wine. And honestly, I think the coconut water kept me from getting hung over! Then we moved on to another Villa Getaway destination Villa in Baan Paradise overlooking Patong Beach perched on the hillside. This villa felt less like a resort and more like a home away from home. I could seriously live here forever. We laid in the sun, drank bottles of wine and dipped in the crystal blue salt pool after long days of boating to explore the Phi Phi Islands, eating lunch on Rang Yai Island, cliff jumping from coral reef covered rocks and walking the streets of Patong. I feel so blessed and thankful to have seen these views and witness such a blossoming, beautiful country. It’s safe to say Thailand stole my heart. I've been trying Sugar Bear Hair vitamins and so far I love them. First of all, they're gluten free, soy free and cruelty free! Those three things make me super happy. They taste like berries and I've actually noticed some growth in my hair AND nails. In the photo you can see how long my nails are getting after 7 days of taking them. I was flipping through old magazines and about to toss some of them out when I came across this guess ad of me from ANTM. I thought to myself, my hair is finally healthy enough to go blonde again and I can take really good care of it now, so why not? The first time I was blonde I had extensions and they pulled out most of my hair leaving it frail and damaged. This time, I was able to lighten it in three processes with minimal damage. I really wanted to go for more of an ash blonde where the grow out would be easier to manage so my stylist friend, Savanna Brown, gave me dark ash blonde roots with balayage highlights. She used Olaplex, which is a bond multiplier that helps protect from breakage due to chemicals. My hair has been through a lot of damage in the past few years and I’ve learned a thing or two about healthy hair from working with professionals plus trial and error. Here’s what I use/ try to do, in order to keep my hair long and shiny. Hair, skin and nails supplement. B-vitamins are essential for hair and nail growth. I like to use Vida Glow marine collagen. It’s done wonders for me. Make sure you check with your doc if you have any seafood allergies because it’s derived from fish. A higher quality shampoo and conditioner. I switch it up all the time because my hair and scalp need variety. (Don’t ask me why, I’m weird.) I’m currently using Nexxus Frizz Defy shampoo and Nexxus Hydra Light Conditioner. I also love their Comb Thru finishing mist. I use oil because I feel like it’s really nourishing to the ends of my hair. I love, love, love Oribe Gold Lust nourishing hair oil. Tons of top stylist's use this on celebrities and models. Apply to the ends before using heat. You may have cringed after reading that, but it’s true. I have been almost every color in the book and I can tell you that nothing beats the shiny, soft texture of natural hair. I lost half of my hair when I went blonde on ANTM. Sadly, it’s taken me almost 3 years to grow my healthy hair back. You can still have shiny hair if it’s dyed, but it will never come as close to the way un-dyed hair looks and feels. This month I'm loving my all black watch from Fifth Watches, Hand-made oatmeal almond bar soap, antique jewelry boxes, dried flowers hung upside down, and soothing citrus essential oil. So I just have to share with you this amazing backpack that I just discovered, from a company in San Fransisco, called Birksun. They specialize in creating solar products that support the technology we all love so much. 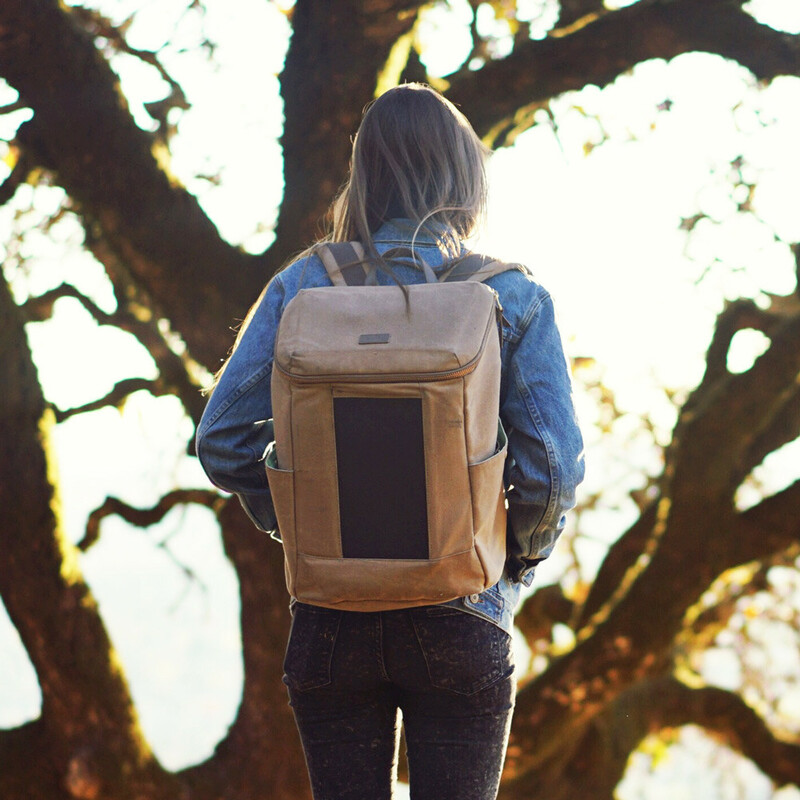 Just leave the Birksun bag out in the direct sunshine for 20 minutes, then plug your favorite electronics like a phone or camera into the USB charging port located inside the bag. I can't tell you how much this bag has made my life easier when traveling or adventuring! I constantly have power with me! I am a hopeless romantic when it comes to style. I love creating dreamy looks or style things into the mood that I am having. I always find myself playing around with style and creating new looks from clothes that I have had for ages. Here are five things you probably didn’t know about my style! 1. I love neutral colors and lots of black! I am terrible at styling colorful outfits. So I use color subtly. 2. Skinny jeans are the only type of jeans I wear. They look good with almost anything! 3. I only wear accessories on special occasions or when I know I am going to be photographed. Otherwise, they tickle my skin! 4. I am cheap. I love getting a good deal on clothes and saving money for other important things in life, like education or donating it to others in need. I love clearance racks and discount stores. 5. Thrift stores are where I find my favorite pieces that have received the most compliments from other people! I love old jackets and jeans! No matter what, I always wear something I feel comfortable in and I feel confident when I know my outfit is attracting positive attention. I try to keep it simple, but well thought out at the same time. I’m a perfectionist and that’s why it takes me so long to make decisions in life. Knowing that your outfit is on point is a great feeling, but so is jumping into sweats and a hoodie and not stressing about what to wear! What are 5 style habits you have? Share in comments below! My newest campaign came out last week for Jacques Marie Mage Spring Eyewear Collection. It was a pleasure working with Designer Jerome Jacques Marie Mage, photographer Dimitri Coste, a great hair and make up team including Donald Simrock and Stylist/ Creative Director Alexis Sepkovic. My character was inspired by Nancy Cunard (pictured below). One thing I have learned about failure is that it teaches lessons that allow you to grow into the person you want to be. You'll understand things differently and know what not to do next time. We are life long learners becoming better humans as we grow into understanding and digesting this enormous world. Wisdom is the end result. I can explain this is through personal example. I got a call from my agency, who had a proposal for a music video and wanted to know if I could dance. I didn't know what to say at the moment, because I had no formal training other than short periods of ballet and jazz classes in middle school, but it sounded exhilarating so I said yes. A few weeks later, I was on set for Fences Official Music Video for their hit single, 'Sunburns'. If I had chickened out, I wouldn't be given the chance to grow, so I made the chance to grow. Here is the Music Video that I took a risk on. It premiered on Rollingstones.com today. You can pre-order their album here. Remember to take risks and ride out this adventure. We all end up dead in the end, so love deeper, live harder, and make it worth it. My career keeps me busy these days and I don't have time to fuss over a complicated skin care routine that includes a whole set of products. I have gotten my skin care routine down to only two products. I love them both for the many benefits they add to my skin. They are mostly natural and very gentle for those of us with sensitive skin. The coolness of the peppermint acts like a natural toner and shrinks up my pores. I feel like I have a clean slate after washing with this soap. I have been using this moisturizer for about 5 years now. Improves scars, stretch marks, uneven skin tone, aging and dehydrated skin. I use this sparingly and massage it into my face and neck. The natural rose fragrance is light to those who are sensitive to the perfumes used in beauty products. I don't only use this on my face, but my legs and hips where I have stretch marks from growing pains. SHOPPING TIP: Before committing to a new skin care routine, buy travel size bottles of the products to try them out if you can't find samples. Hope you like them as much as I do.